Seeds are stored in a climate-controlled Seed Bank on our farm/headquarters in northeast Iowa. As part of Project Regeneration, our Preservation team take us behind the scenes into how they regenerate seeds on our farm. This is vital step in caring for our collection. Each year our curator selects hundreds of varieties to grow for seed regeneration. Some varieties are selected due to low inventory - we want to keep an adequate supply of seed in our bank and have have enough to share. Others need to be regenerated because they have poor germination, which has many causes, such as age or the seed may have come to us in poor condition. (We do germination testing in our lab, which enables us to observe the seed’s germination ability without first planting it.). Still other seeds are selected based on their market potential (meaning, it’s a variety that possesses a certain quality that would be appealing to gardeners and growers and may be a catalog candidate). Once a variety is scheduled for regeneration, its seed packet is retrieved from cold storage and the appropriate number of seeds are removed and set aside. The seeds then eagerly await their big planting day. Lettuce seedlings growing in the greenhouse. In anticipation of spring, we fire up our greenhouses in early March. Over the next few months, we start around 50 crop types from seed in the greenhouses. By the beginning of June, the greenhouses are a dazzling display of hundreds of varieties waiting for their day to be planted in the field. In the meantime, our field manager maps out gardens around the farm and the location of each variety. To ensure varietal purity and a healthy seed crop, we take into account isolation distances to avoid cross pollination, population sizes, crop rotations, and spacing needs when planning. Our team releasing pollinators into isolation cages in the fields. The final map is a checkerboard of about 10 half acre isolation gardens spread out around the farm, separated by half a mile or more of pasture, woodlands, limestone bluffs, and wetlands. (Different varieties within a crop type must be planted certain distances apart so that they do not cross pollinate with one another.) Other varieties are planted in large isolation cages with self-sustaining pollinator populations. As soon as the transplants outgrow their pots, they are planted in the gardens by the field crew. May and June are a frenzy of building deer fences and isolation cages, tilling the soil, planting, trellising, fertilizing, watering, and labeling - tasks all done with the care, attention, and respect that these varieties deserve. 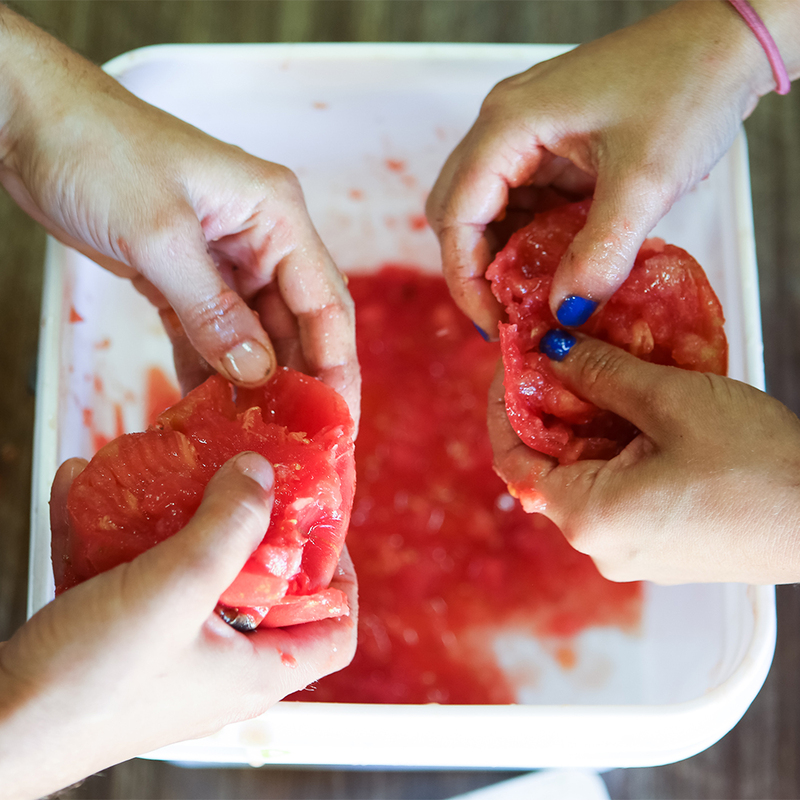 removing seeds from tomatoes, preparing them for processing. Even before planting season has finished, the harvest season commences. Biennial crops in their second year are the first to set seed. Then our annual garlic harvest of over 200 varieties follows in mid-July. At this time peas, spinach, and lettuce are all maturing while tomatoes, beans, and peppers are starting to mature. The culmination of summer brings an abundance of cucumbers, melons, eggplant, okra, squash and other varieties with seeds that need to be harvested, processed, and dried in a precise timetable to ensure the highest quality seed that will last in the deep freezer. The process is a highly coordinated and a well synchronized succession that repeats itself year after year. Newly harvested seed from the regeneration process refreshes and replenishes our bank. Through the process, we are also able to observe and evaluate varieties and decide which varieties could be introduced to our seed catalog and your garden. 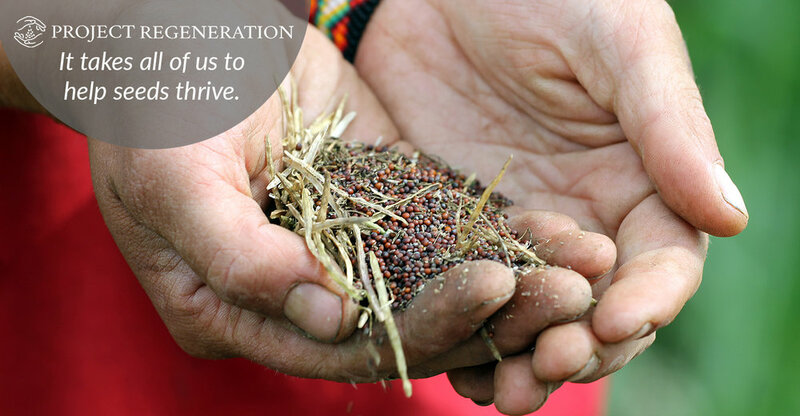 Regeneration fulfills our mission to steward, protect, and share the diverse collection of seeds entrusted to us.